BONN, Germany, November 14, 2017 (ENS) – “We’re here, we’re in and we’re not going away,” California Governor Jerry Brown said of many U.S. states and cities at the ongoing UN climate talks in Bonn. Despite President Donald Trump’s vow to pull the U.S. out of the Paris Agreement on climate, many U.S. states and cities are still committed to the Agreement. “When cities and states combine together and then join with powerful corporations, that’s how we get stuff done,” said Governor Brown at a November 11 event at the U.S. Climate Action Pavilion, a purpose-built exhibition space made up of large interconnected blow-up bubbles sponsored by U.S. non-federal leaders at COP23, the 23rd Conference of the Parties to the UN Framework Convention on Climate Change, UNFCCC. For the first time at a COP, the United States has not erected an official pavilion. There is a delegation representing the U.S. government here in Bonn, but it is small and weak, and cloistered behind closed doors. Instead of leading discussions of how to reduce greenhouse gas emissions, it is promoting “clean coal” as the way to fight climate change. The non-federal “We Are Still In” movement appears much stronger. Brown, the conference’s Special Advisor for States and Regions, joined Michael Bloomberg, the UN Secretary-General’s Special Envoy for Cities and Climate Change, to reaffirm the commitment of America’s states, cities and businesses to the Paris Agreement. “Promoting coal at a climate summit is like promoting tobacco at a cancer summit,” said Bloomberg. “It’s also a denial what’s happening in the U.S. – half of all American coal plants have been retired over the past six years, thanks to market and community forces and leadership by cities and states. That trend will continue no matter what happens in Washington, and we are now working to help the rest of the world move beyond coal too. 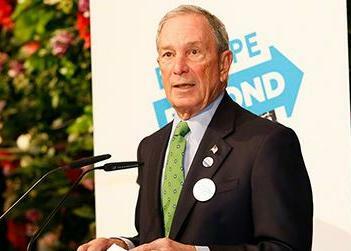 If the administration won’t lead it should at least get out of the way, Bloomberg said. Cities, states and businesses representing more than half the U.S. economy and population have declared their support for the Paris Agreement, including more than 2,300 signatories to the “We Are Still In” declaration. More than 100 American leaders from state and local government, businesses, and universities have made the trip to Bonn to participate constructively in the UN climate talks. The leaders and organizers that have participated in the US Climate Action Center share no affiliation with the Trump Administration’s fossil fuel event and are responding to the event with the quotes below. These 100+ leaders are among a large and growing network of leaders, now numbering over 2,500, who represent more than $6.2 trillion of the U.S. economy and over half of the American population that is saying “we are still in” on the Paris Agreement. 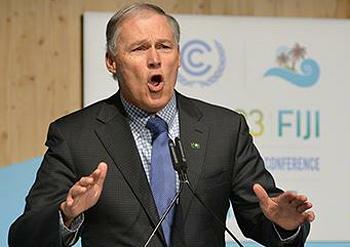 Many of these climate leaders participated in an event on Saturday in the U.S. Climate Action Center that reaffirmed America’s Pledge to meeting the U.S. commitment under the Paris Agreement. 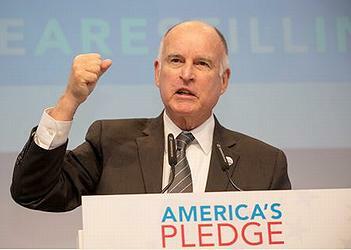 Brown and Bloomberg joined forces in July to launch America’s Pledge on climate change. This effort is helping to compile and quantify the actions of states, cities and businesses to drive down their greenhouse gas emissions consistent with the goals of the Paris Agreement. That goal is keeping the increase in global average temperature beyond pre-industrial levels to below 2 degrees Celsius, the level of potentially catastrophic consequences, and below 1.5 degrees C, if possible. “To achieve the goals of the Paris Agreement, we are helping to build a Grand Coalition to accelerate climate action across all nations and at every level of society,” said COP23 President Prime Minister Bainimarama of Fiji, which is hosting COP23 in Bonn. “So I am delighted to welcome the commitments that have been made through America’s Pledge from members of that coalition in the U.S. among the non-state actors such as governors and mayors. This imaginative initiative by Governor Brown and Michael Bloomberg shows that the campaign for climate action in America remains strong. I also hope that it is a model that can be followed elsewhere in the world as we bring everyone together to pursue a more ambitious response to the challenge of climate change,” said Bainimarama. Today, Governor Brown joined Canada and Mexico’s top climate representatives at COP23 to affirm North America’s commitment to climate action and the Paris Agreement. “We agreed today to strengthen our climate initiatives through a new North American Climate Leadership Dialogue. We will share progress on these goals at the 2018 Global Climate Action Summit to be hosted by California this September,” the leaders said. The Dialogue will address topics including clean transportation and zero-emission vehicles, vehicle efficiency, clean technology, supporting clean power while reducing reliance on coal-fired electricity, carbon pricing initiatives, and reducing short-lived climate pollutants. 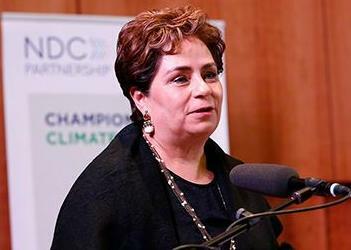 “If the challenge of climate change is to be solved and the opportunities of a low carbon transition harvested, we need all sectors of society in all nations fully on board,” encouraged UNFCCC Executive Secretary Espinosa. “Cities, states, regions and territories have, along with business and civil society, been an inspiration before, during, at and following Paris. Here I want to pay tribute to Jerry Brown, California’s Governor, UN Special Envoy Michael Bloomberg and all the states and cities of the USA who have been aligning their pledges and actions with the Paris Climate Change Agreement,” said Espinosa. On November 11, Governor Brown joined Virginia Governor Terry McAuliffe at an Under2 Coalition signing ceremony by which Virginia joined the coalition. With the addition of Virginia, the Under2 Coalition now includes 189 cities, states and countries collectively representing more than 1.2 billion people and $29.4 trillion GDP – equivalent to over 16 percent of the global population and 39 percent of the global economy. Collectively, they form the Under2 Coalition, which represents more than 1.3 billion people and $30 trillion in GDP – equivalent to 17 percent of the global population and nearly 40 percent of the global economy. On November 11 at the U.S. Climate Action Center, a town hall style event brought together members of the U.S. People’s Delegation, diverse climate activists and leaders from across the United States to discuss U.S. climate action moving forward. While the U.S. national government has abdicated its responsibility to tackle climate change, the presence of civil society activists and local U.S. leaders at this COP demonstrates the climate commitment represented by #WeAreStillIn.